Olivier Roellinger is one of France’s all-time greatest chefs. He first opened his restaurant at the Maisons de Bricourt in April 1982, and proceeded in due course to deservedly win all of France’s highest culinary awards and accolades. On December 20, 2008, tired of the forks, stars, hats, and “best whatever” rat race, he closed that restaurant and shifted all his attention to his other dining establishment, the beautiful seaside Le Coquillage, where he could devote himself to a less complex but no less demanding cuisine that still spoke of his beloved native Brittany and the many trips he had taken to exotic lands over the years. And to think that was nearly not to be the case. For one day in May 1976, a young Olivier Roellinger was viciously assaulted and left for dead. Once he emerged from the coma, his life as he had known it (of races, of boats, of motorcycles) was over, and he had to decide what to do next. Upon returning home, he greatly enjoyed his old friends coming over to see how he was doing, and bringing over edible gifts that his mother would cook for them to savor: oysters, herbs, fish… In fact, many of Roellinger’s friends had taken jobs dealing with food; for example, some had become professional fishermen and others raised oysters. His mother had always been a great cook, and now, with plenty of time on his hands, Roellinger found he was reading more and more about food. He was fascinated by French culinary history and the exploits of great chefs like Carême and Nigeon. Logically enough, the next step was to become an apprentice and hone his future craft, and so Roellinger went to learn in the restaurants of his native Cancale and nearby Saint-Malo, followed by stints at the Château de la Corniche near Mantes-la-Jolie (where André Guillot taught him the importance of simplicity and sobriety in cooking, something that many modern super-hyped chefs would do well to spend a little time thinking about), then Aux Trois Marches at Versailles (where he learned the advantages of cooking only with in-season ingredients), and then Guy Savoy, before finally returning home to Cancale and opening his restaurant. And so began a happy, if hard, life of early-morning awakenings to reach the local fish market before others, and the establishment of long-term relationships built on mutual trust and respect with the best of Brittany’s farmers and fishermen: people like Paul Renault, super-specialist of pigeons, ducks, and especially the Coucou Rennais, a historic Breton breed of chicken that was in danger of extinction but was intelligently and meritoriously brought back to everyone’s attention thanks to a 1988 rebreeding program launched by the Rennes Ecomuseum; the Bocel family, outstanding vegetable farmers; Annie Bertin, who grew rare herbs and plants at a time when, as Roellinger recalls, most people hardly recognized basil; Valentine Roy, who focuses on the magnificent cheeses of Brittany and Normandy made by small family concerns; and many others over the years. All that being true, it is spices and herbs that are at the heart of Roellinger’s Breton cuisine. He has been studying them incessantly for years, not just in Brittany but around the world, and has cultivated long relationships with small growers in nearby and very far away places. For years, he has selected what he believes to be the best, most flavorful spices, in addition to the highest-quality herbs, seeds, leaves, flowers, barks and roots, often artfully blending them in his own named mixes. For example, the “Poudre à Braises” is a mix of various spices and herbs that includes six different peppers (from Japan, Jamaica, Sri Lanka and Madagascar, for example) and two chilies, a blend Roellinger finds to be an ideal seasoning mix for barbecue-grilled fish, vegetables and meats. The “Poudre de Neptune” is a mix of local algae and wild fennel that marries particularly well with shellfish and fish preparations. The “Jardin Marin” is a mix of algae that enlivens dressings and simple butter sauces, while the “Three Mexican Chilies” is a mix of Guajillo, Ancho Rojo and Chipotle Meco chilies meant to be a jack-of-all-trades or everyday condiment. Today, the Maisons de Bricourt is a very successful hotel, restaurant and spice empire led with equal competence and flair by Olivier and Jane’s son Hugo (who took over at the tender age of 28), though Olivier is still around. 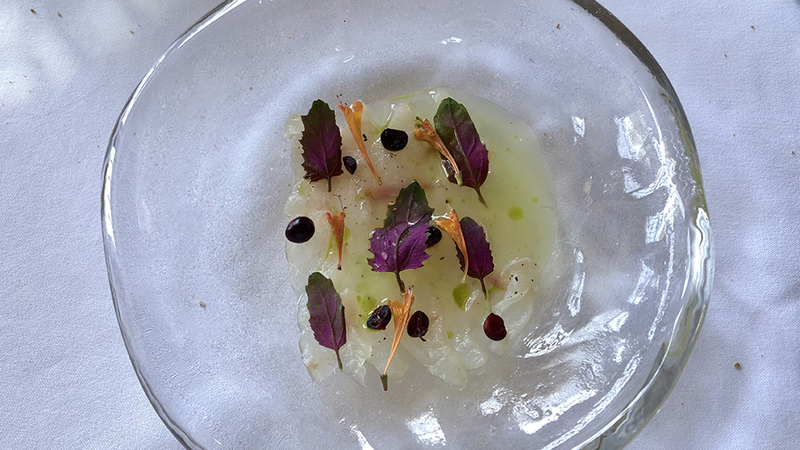 Hugo trained with some of the best in the business, including Michel Bras, the Troisgros family and Pierre Gagnaire, and you can tell by his first-rate cooking. 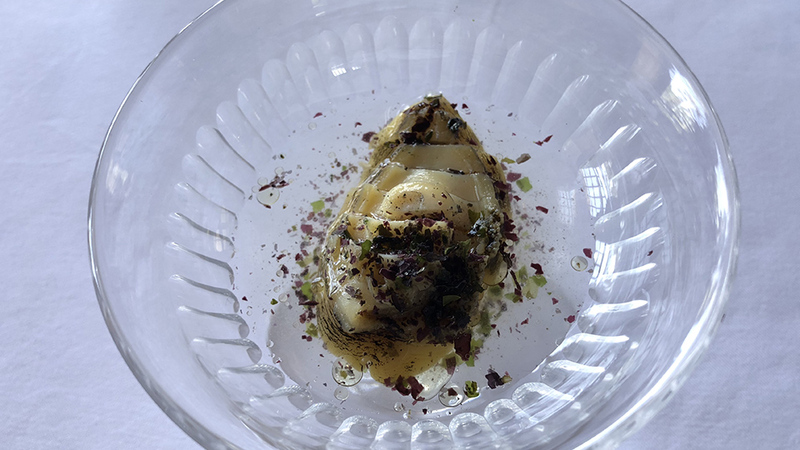 More importantly, my many visits to Le Coquillage have taught me that Hugo is blessed with just as refined and nuanced a hand in the kitchen as his father – traits not always apparent in the food hurtling out of many of today’s professional kitchens. 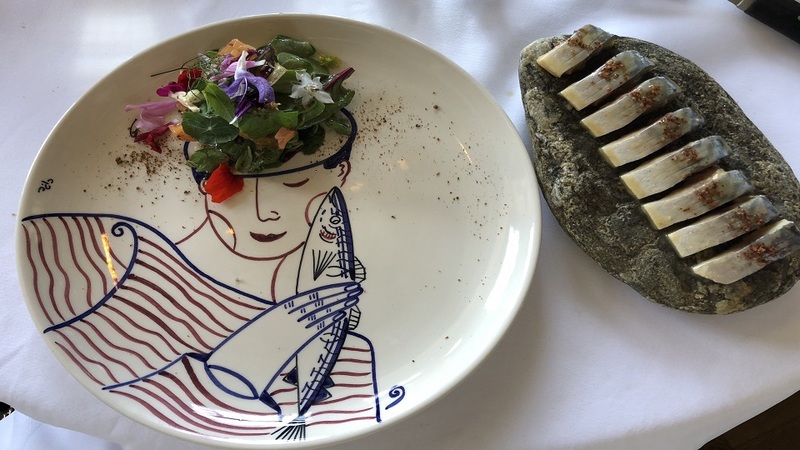 The latest meal at Le Coquillage was spectacula. My eyes, olfactory neurons and taste buds were greeted with one dish after another brimming with notes of iodine and fresh sea air, of algae and fresh fish, and repeating, lingering, deep, soulful aromas and flavors; all in all, a three-hour-long experience of very fresh and flavorful seafood. So much so that I would be unable to pick a best dish of the day. 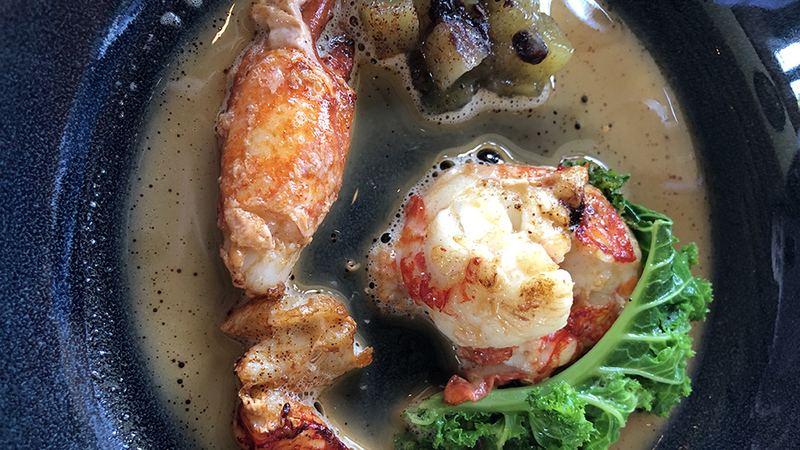 Maybe the heady mix of lobster with cocoa, “Three Mexican Chilies,” and sherry wine, a dish in honor of Daniel de La Touche, Lord of La Revardière(1570-1631), a Cancalese captain who was always fighting on behalf of the Huguenots against the Catholics, prior to buying a ship and going off to explore new lands, which he did very successfully, founding, along with Admiral François de Razilly, the city of Saint-Louis-du-Maragnan, now simply known as São Luís, on the coast of the northeastern Brazilian state of Maranhão. Or perhaps it was the seaweed-marinated sea bass, with melon, agastache (“agastache” refers to perennial herbal plants that are mostly native to North America, but there are Asian members of the genus too) and Neelamundi pepper (the latter is a black pepper typical of the Wayanad district in the northeast section of the Indian state of Kerala). You begin to understand the Roellinger family’s passion, obsession even, with spices and herbs when you realize that India alone grows at least 75 different cultivars of black pepper, including the likes of Kalluvalli, Jeerakamundi, Cherumaniyan, and Karimund. No, wait: I think my favorite dish of the day was the cotriade, a local, traditional and very simple fish soup that is to Brittany what bouillabaisse is to Mediterranean France. Much like the brodetto soups of the Adriatic that I have discussed at length in a previous Vinous Table (see Uliassi, December 2016), the cotriade too was made by families upon the return of the seafaring man of the house, or prepared directly on the ship’s deck while still at sea (the name cotriade derives from the Breton word kaoteriad, meaning the share of the catch brought back home by the sailor, but also refers to the contents of the kaotern, or cauldron, that was used to cook the catch in). On this day, I simply could not get enough of the cotriade’s intensely flavorful, delicately iodine-tinged and only apparently simple but rather sneakily concentrated and complex aromas and flavors. When by the sea in the summertime, I usually like to keep my wine choices simple. It’s admittedly hard to pass on cider when in Brittany and Normandy. I find the former’s cider to be usually fleshier and drier than those of the latter region, but the NV André Nicol Pure Apple Cider Royal Guillevic is an absolute joy; dry and sweet at the same time, it’s a monovariety cider made with the Guillevic apple (originally from the countryside of Auray, Lorient and Vannes near the Gulf of Morbihan) that offers very bright lemony bite nicely extending the pomaceous orchard fruit sweet-and-sour flavors on the long back end. It makes an absolutely smashing, highly perfumed aperitif and is by far the best Breton cider I have ever tasted (many are just too dry-tasting, not to mention so fleshy they border on heaviness, and need food just to be palatable). 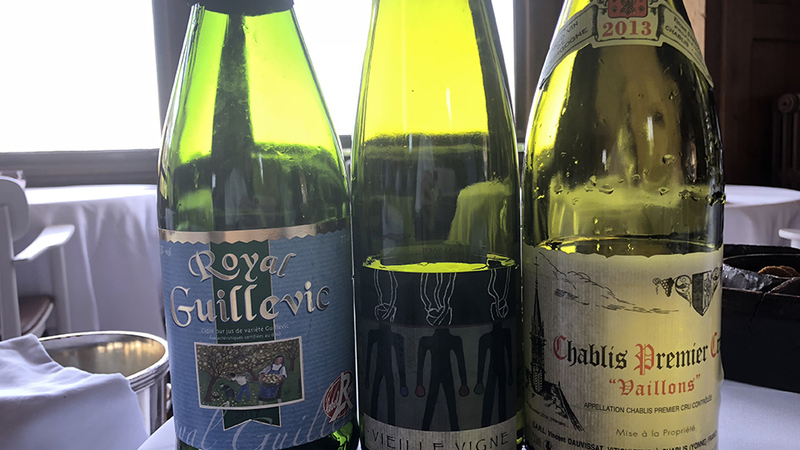 The NV Domaine Rietsch Sylvaner Vieilles Vignes is a cuvée of the 2015 and 2016 vintages made from a well-regarded domaine in Mittelbergheim in northern Alsace’s wine region, where the famous Zoztenberg grand cru gives life to some of Alsace’s most famous and sought-after Sylvaner wines. Rietsch is certainly one of the area’s better producers, but the low-sulfur house style does very little for the preservation or identification of the cultivar’s pretty aromas and flavors, which is a real shame. In fact, you might say I had more cider to follow upon my first cider, and I’m not trying to be funny. What it all meant is that I had to hurriedly ask to bring over my last wine of the day, the 2013 René et Vincent Dauvissat Chablis Premier Cru Vaillons, a masterpiece of precision and purity given the difficult vintage, featuring apple, mirabelle and menthol aromas and flavors lingering long on the clean, finely chiseled aftertaste. Some days are more beautiful and memorable than others. 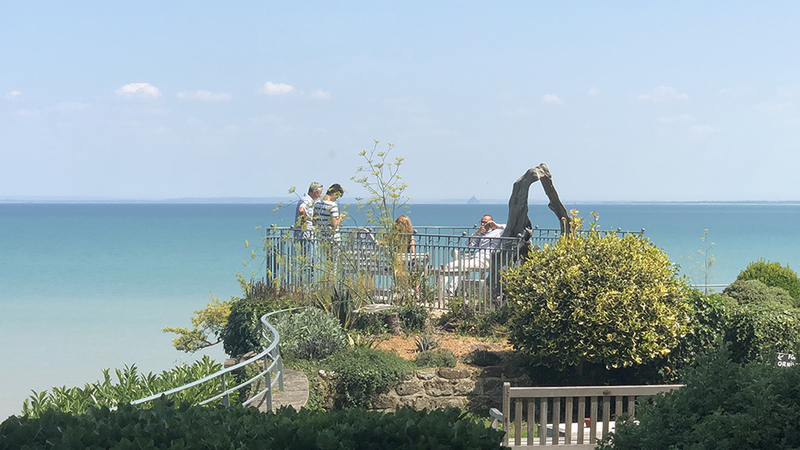 When sitting in Le Coquillage’s old-fashioned but elegant dining room, with superb views of the Bay of Biscay before you and the magnificent food at your table, rest assured that your day will fall into the “more beautiful and memorable” category more often than not.